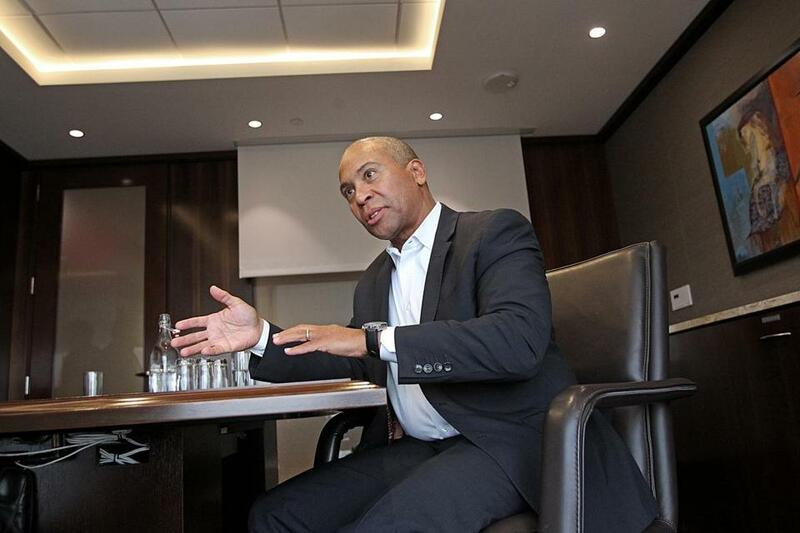 Former governor Deval Patrick said he has found significant satisfaction in his work developing the Double Impact fund. Deval Patrick now has $390 million to spend on his next act, investing in companies that provide a social benefit in addition to financial returns. The former governor is a managing director at Bain Capital, which Monday said it closed on its first so-called impact fund, entering a crowded field where other managers have already invested more than $100 billion. In an interview, Patrick said Bain’s Double Impact fund has already made its first two investments, a group of gyms that promotes fitness in communities with poor health outcomes, and an organic waste recycling firm in Texas. The former governor said he is confident that companies such as those can provide a social good while delivering profits to Bain investors. While some social impact funds temper their profit expectations, Patrick expects his fund to perform as well as traditional private equity funds at the giant Boston investment firm. “I feel like I’ve spent a lot of my career confronted by what turn out to be false choices, and in many cases this notion that you have to trade return for impact — that you can’t do well and do good — is an example of one of those false choices,” said Patrick, 60. The Bain fund will focus on North American companies working in the broad categories of sustainability, community building, and health and wellness. Bain said its partners and employees put in $40 million of the $390 million raised for the fund. Other investors included pension funds affiliated with Los Angeles public employees, foundations, financial institutions, and investment offices of wealthy families. Impact investing has been growing in recent years, and other professional investors say they are able to accomplish social goals while bringing in healthy results. A survey of 209 investors in the field released this year by the Global Impact Investing Network said two-thirds were targeting market-rate returns. And of those investors who provided performance information, 91 percent said their funds met or exceeded expectations. The firm’s first investments were in Living Earth, the largest recycler of landscaping waste in Texas, and Impact Fitness, a group of franchisees of Planet Fitness that promotes healthy lifestyles in underserved communities. Bain did not disclose the terms of those investments, but said investments from the Double Impact fund will generally be between $10 million and $40 million. Patrick said the two companies are aligned with the fund’s approach of finding established companies that need capital and guidance to grow. “These are mission-oriented founders who have very profitable businesses already, who are really trying to think about how to . . . expand the mission as they expand the commercial enterprise,” he said. Patrick said the fund would also look at companies which have an established mission but are looking to make more money or grow faster. Double Impact expects to invest in 12 to 15 companies over five years, taking a controlling stake in each. Patrick, who joined Bain in 2015, said he has found significant satisfaction in his work developing the fund. The former governor, who has been quiet politically since his departure from office, did not want to talk about his political future in an interview — steering the conversation toward his work at Bain.